The portable speaker market in the last five years has seen a lot of new portable Bluetooth speakers introduced to the market. There are a number of new manufactures on the market producing speakers that are very durable, have waterproof capabilities and longer battery life. Listening styles have changed and purchasing a large stereo system is less popular than in the past, especially with the younger generation. Older audio companies have also been changing with the times and have been introducing their own portable Bluetooth speakers in various sizes. Companies like Bose, JBL and Harman Kardon all have new portable speakers to offer. Many are design to be a go anywhere speaker that can handle being submerged in water and can take a little knocking around in a packsack. Battery life is around 8 to 12 hours on many portable speakers. Most are a square or rectangle design with rounded corners. 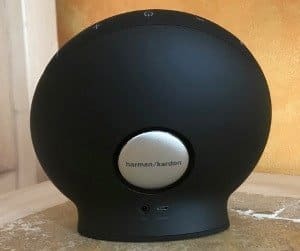 The Harman Kardon Onyx speaker line has set itself apart by being total round with a more elegant stylish classic speaker look. The Onyx speakers come in two sizes the Onyx Mini retailing for $199 and the Onyx Studio 4 a much larger speaker retailing for $449. The design of the Onyx speaker series is a circular round beautiful speaker with a rugged mesh finish on the front and a rubber casing covering the rest of the surface area. The Onyx speaker is a more formal sophisticated looking speaker compared to the Bose Soundlink or the JBL Flip 4. The Onyx Mini is almost as rugged but with no waterproof capabilities. This speaker was designed to fit in a home or office and is available in a number of classy colors to match any decor. The Onyx can be easily moved around with its wireless capabilities. It will work great at the beach but I believe it is more suited for the home or office. Front of the speaker has a nice mesh grill. Around the back is an active transducer producing a nice bass. On the bottom back is a Micro USB port and a 3.5 mm auxiliary port. The controls and 5 LED battery indicator all are located on top. The Onyx Mini is pretty simple to operate. The controls are all located on the top and on the back is an active transducer that gives the Onyx that extra bass. This button performs a few functions. First it is a music controller: press once for play or pause, a double press will skip to the next track. Also, when a phone call comes in press once and it will activate the speakerphone. Bluetooth pairing button. 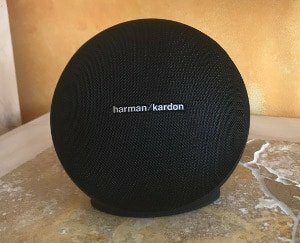 Press to find a new device or hold for 5 seconds to connect with another Harmon Kardon Onyx mini or Onyx Studio 4 speaker with HK Connect+ for wireless dual sound. The dual sound will play in mono and not in stereo. With the Onyx mini you can stream music via Bluetooth. Three smart devices can be connected at the same time so you can take turns playing music. Built-in rechargeable Li-ion battery supports up to 10 hours of playtime and takes about 3 hours to charge. My testing at 70% volume I got close to 15 hours, almost double compared to the Bose Soundlink 8 hours play time. The Onyx was designed for around the house comes with a USB cable and USB power adapter for easy charging. I can see this unit sitting somewhere plugged in most of the time and when portability is needed, the long playtime will give you a full day of wireless listening in your backyard. Harman noise and echo cancelling technology delivers clear conference calls. Speaker phone quality is excellent. For a full home audio system you can easily wirelessly connect another Onyx mini or the larger Onyx Studio 4. With HK Connect+ you can link more than 100 speakers. The overall sound quality and volume are impressive for the size of the Onyx Mini. The sound is arguably better than the Bose Soundlink and more sophisticated than the Charge 3. I found with the Onyx Mini the sweet spot was at about 70% to 80% volume. I found beyond that the bass got a little lost. An even sound signature with a good amount of bass for its size. A punchy tight bass is produced to give it a warmer sound than other speakers of this size. Midrange frequencies are slightly pushed to the front and vocals are clear and crisp. The high end is not overly crisp but all the highs are there nice and clear. The Onyx Mini has five different colors to choose from and the Onyx Studio 4 has three to fit any color pallet in your home or office. The Onyx Mini is more of a formal design compared to some of its competitors. It is an ideal speaker to have around the house in a bedroom, bathroom, office or kitchen. Its wireless portability makes it easy to take out to the backyard for some sun tanning or gardening. If you want a speaker to throw in your backpack and take to the beach and not worry about it getting a little wet then the Bose Sound Link or the JBL Flip 4 would be a better choice. If you would like an elegant speaker that can be easily moved around the house, has impressive sound, good volume, is easily expandable and comes in a number of tasteful colors to choose from, makes the Onyx Mini an ideal speaker for a home or office. Its closest rival in sound comparison is the Bose Soundlink that retails for $129. The Onyx Mini retails for $199, but since its release, it has been consistently on sale. I have recently seen the Onyx Mini for under $100. Not many speakers at that price sound as good and this makes this speaker a great buy and a reason to buy two. See latest Amazon Pricing. If you like the look of this speaker and want to kick it up a few notches the Onyx Studio 4 is a very impressive sounding speaker. Three times larger than the Onyx Mini with a retail price of $449, but I have seen it at times on sale at a ridiculously low price of $129. See latest Amazon Pricing. The Onyx Mini is a very impressive small speaker. It is one of the best sounding speakers on the market for its size. Its suggested retail price of $199 may seem more expensive than its competitors but with it outperforming most competitors and the bonus that it consistently goes on sale for close to or under $100 making this speaker one of the best buys on the market today. If you do have space I would suggest getting the Onyx Studio 4. This speaker's sound is incredible and with the crazy sale price below $150 makes them a real steal. If you want a small good quality speaker for around the home or office with a more sophisticated look you will not be disappointed in the Onyx Mini Speaker.